We study neuroanatomy and neurosecretory neurons in water fleas Daphnia to understand the physiological basis of impacts of chemical substances in human-borne water pollutants that affect growth and reproduction in a keystone organism in aquatic ecosystems and one of the most important test organisms in ecotoxicology. As in many other animals and humans, neuropeptides and hormones are key regulators of nearly all physiological processes. In arthropods, an enormous diversity of neuropeptide hormones allows for adaptive physiology of organisms for instance small water-borne micro-crustaceans (2), such as the water flea Daphnia. Why studying endocrine mechanisms in such small organisms? Daphnia is not only a keystone organism in the food chain of many water ecosystems but also since a long time the test organism in ecotoxicology and water pollution research. In most countries of the world, the Daphnia reproduction test as a decisive and mandatory test either by law or recommended by the OECD has to be performed on discovered water pollutants or new chemical products before they are allowed to enter the environment. Most environmental chemicals and pesticides tested in Daphnia affect reproduction and growth of these sensitive water fleas. Many agricultural pest control chemicals, human remedies and so-called endocrine disruptive substances end up in sewage out-pulls that affect survival and life cycles of Daphnia and dependent organisms, thereby sensitive ecosystems in water bodies from which often our drinking water originates. We know surprisingly little about how physiological mechanisms act normally in the water flea. A breakthrough in this respect was the recent unravelling of the so far only available and fully annotated crustacean genome of Daphnia pulex to which we have contributed (Colbourne et al. Science, 2011). This allows for genomic and postgenomic comparisons of known and/or investigated physiological mechanisms in Daphnia and other arthropods such as insects. Over more than 200 years, biologists have investigated Daphnia, but many aspects of its anatomy and physiology are still enigmatic. To bring light into this anatomical and endocrine physiological darkness, we study neuroanatomy and neurosecretion in Daphnia species. We recently identified 43 novel genes in Daphnia pulex encoding 73 predicted neuropeptide and protein hormones, most of which were fully identified by MALDI-TOF mass spectrometry (3). Our efforts to localise several of these neuropeptides in the nervous system of Daphnia imply that several neuropeptides not only look very similar but also act similarly as in other arthropods. The neuropeptides are part of a minute but astonishingly complex central nervous system, the neuroanatomy of which we now have studied in great depth (4). Our approach gave insights into the endogenous biological clock of two Daphnia species for the first time in crustaceans. Neurons of this clock system produce a homologue of pigment-dispersing factor (PDF) a well-established neuropeptide of the insect biological clock (5, 6). Many other important regulatory elements in metabolic physiology such as crustacean hyperglycaemic hormone family peptides we established in Daphnia magna as well as members of general neuropeptide control cascades of growth by moulting and of reproduction of arthropods (7, 8). 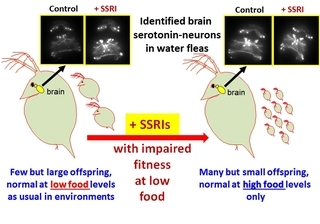 Our ecotoxicological approaches on the impact of widely prescribed human antidepressants (selective serotonin-reuptake inhibitors = SSRIs) on identified serotonin-neurons in Daphnia have recently shown that such remedies deeply impair serotonin-regulation of reproduction in water fleas, thereby threatening their populations in the environment (1). There is collaboration with SU institutions such as Department of Environmental Sciences and Analytical Chemistry (ACES) and with universities in Germany, Denmark, Spain and North Wales (UK). Bruno Campos, Claudia Rivetti, Timm Kress, Carlos Barata, Heinrich Dircksen. 2016. 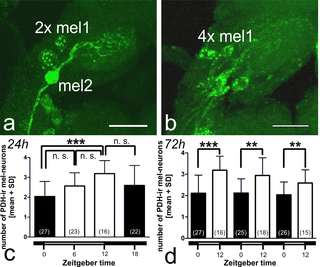 Depressing antidepressant - Fluoxetine affects serotonin neurons causing adverse reproductive responses in Daphnia magna. Environmental Science and Technology 50: 6000-6007. Heinrich Dircksen. 2013. Crustacean bioactive peptides. In Handbook of Biologically Active Peptides, pp. 209-221. Academic Press Elsevier, New York. Heinrich Dircksen, Susanne Neupert, Reinhard Predel, Peter Verleyen, Jurgen Huybrechts, Johannes Strauss, Frank Hauser, Elisabeth Stafflinger, Martina Schneider, Kevin Pauwels, Liliane Schoofs, Cornelis J. P. Grimmelikhuijzen. 2011. 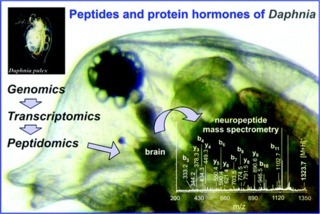 Genomics, transcriptomics and peptidomics of Daphnia pulex neuropeptides and protein hormones. Journal of Proteome Research 10: 4478-4504. Timm Kress, Steffen Harzsch, Heinrich Dircksen. 2016. Neuroanatomy of the optic ganglia and central brain of the water flea Daphnia magna (Crustacea, Cladocera). Cell and Tissue Research 363: 649-677. Johannes Strauss, Heinrich Dircksen. 2010. Circadian clocks in crustaceans - identified neuronal and cellular systems. Frontiers in Bioscience 15: 1040-1074. Johannes Strauss, Qian Zhang, Peter Verleyen, Jurgen Huybrechts, Susanne Neupert, Reinhard Predel, Kevin Pauwels, Heinrich Dircksen. 2011. Pigment-dispersing hormone in Daphnia interneurons, one type homologous to insect clock neurons displaying circadian rhythmicity. Cellular and Molecular Life Sciences (CMLS) 68: 3403-3423. Simon George Webster, Rainer Keller, Heinrich Dircksen. 2012. The CHH-superfamily of multifunctional peptide hormones controlling crustacean metabolism, osmoregulation, moulting, and reproduction. General and Comparative Endocrinology 175: 217-233. Qian Zhang, Rainer Keller, Heinrich Dircksen. 1997. Crustacean hyperglycaemic hormone in the nervous system of the primitive crustacean species Daphnia magna and Artemia salina (Crustacea: Branchiopoda). Cell and Tissue Research 287: 565-576.